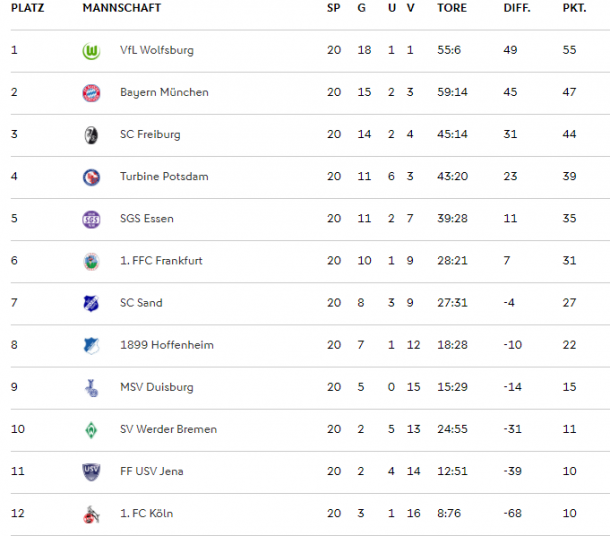 A midweek win over Freiburg followed by a weekend win over Essen was enough to Wolfsburg to retain their Frauen-Bundesliga title with two games to spare, Munich’s charging win in Bremen enough to keep the Bavarians second. A narrow win away in Frankfurt has kept Freiburg’s slim chances of finishing in second alive as Potsdam and Sand dealt Köln and Jena’s survival hopes a blow with Duisburg a point from safety after a win over Hoffenheim. Dealing with the last of their games in hand, Wolfsburg cruised past a weakened Freiburg side to put them in perfect position to claim the title the same week in their second outing of the week. A slick passing move saw the Wolves take the lead five minutes in, Cláudia Neto the hinge to bring all the parts of the Wolfsburg attack together feeding Pernille Harder for the Dane to lash into the roof of the net. The advantage doubled ten minutes before the break when the home pressure told and Ewa Pajor capped off a move that saw Harder slip the ball through to Caroline Graham Hansen, the Norwegian squaring for Pajor to slot into the open net. Improving after the break, the visitors didn’t have the rub of the green, coming close a number of times but unlucky not to convert, the hosts still looking dangerous when they got in too. After Klara Bühl had seen one chance slip just wide and one blocked by Almuth Schult, Hasret Kayikçi had a shot cleared off the line, the sport club unable to reduce the deficit, leaving Wolfsburg on the verge of the title. Back in action in the north four days after their loss in Wolfsburg, Freiburg gave their slim hopes of finishing in a European position a boost with a win against a struggling Frankfurt side. Rebecca Knaak’s pull back for Kayikçi 17 minutes in enough for the 26-year-old to nudge the ball past Bryane Heaberlin at the near post. The game hanging in the balance, Kathrin Hendrich had a shot turned over by Maria Korenčiová before Bühl nodded Lena Petermann’s lofted cross home. With just one win in their last five, FFC have at times been goal-shy this year, a stoppage time goal from Lily Agg not enough to change the result on the day as she volleyed Korenčiová’s parry into the open net. A team in need of points, Jena were left empty-handed at home as they clashed to Sand. Dealt a blow two minutes in when Amelia Pietrangelo clashed with Leticia Santos and was forced off the hosts were soon a goal down too. Floating around the back line, Verena Aschauer did well to battle off three defenders closing her down as she swept the ball under Erin McLeod, the first half goal enough to settle the tie. Struggling for form this year, Hoffenheim fell to their twelfth loss of the season away to a Duisburg side refusing to give up on chasing safety, MSV now just a point from confirming top flight status for next season. A slow burner at the PCC-Stadion, the hosts saw the better chances over the first 70 minutes, the pair stubbornly locked scoreless, the tide turned late in the day when Barbara Dunst pulled a fine save out of Friederike Abt from 25-yards. Growing in confidence as the match wound down, the hosts found an opening five minutes before time, Geldona Morina’s snap-shot fired into the right side of the net. With their noses in front, the Zebras grabbed a late second when Yvonne Zielinski volleyed Stefanie Weichelt’s dinked cross home deep in stoppage time. Undone by their inability to score, or score more than one, in recent months, the Turbines recovered well from a jarring loss to Bayern last time out to heap the pressure on relegation-threatened Köln. Rising with Rahel Kiwic, the centre-back pair both went for Svenja Huth’s eighth-minute floated corner, the ball skimming off of Kiwic’s head for Amanda Ilestedt to flick into the bottom corner. Having just drawn a solid save from Marie Wenzl, Viktoria Schwalm’s efforts were clearly not for naught as Johanna Elsig’s glancing header saw the ball slip through the crowded box and find the open net. Still asking questions of the visitors after the break, Potsdam saw their advantage slashed in half, predictably for the match, at a set piece. Julia Arnold’s floated free-kick met by an unmarked Amber Hearn near the back post, the Kiwi’s determined run and header giving the Billygoats a lifeline in the tie. However, as soon as the away side were back in it, the hosts had their cushion restored, Felicitas Rauch’s shot from the edge of the area driven low to the far corner. Not going down without a fight, Köln reduced the disadvantage to one three minutes later, though Potsdam loanee Lidija Kuliš. Chasing down a silky woven pass from Kristina Hild, Kuliš broke behind the Turbine defence with ease, chasing the ball before taking a touch in the box and curling it inside of Lisa Schmitz. Making just her fourth appearance of the year, Wibke Meister did well to run down a low through ball, taking it to the by-line before cutting back for Lara Prašnikar to clip home and regain the two goal advantage late in the day. Absent from the top of the Bundesliga tree for two years before wrapping up the title last season, Wolfsburg have only gone from strength to strength this season, easing away from the pack and only dropping five points in their first 19 matches of the season. Eight points clear of Munich coming into their 20th match of the season, Wolfsburg wrapped the title up with two to spare, give the team something to celebrate before another gruelling two weeks that will see the Lower Saxony side feature in two more finals. Kept quite in the first half against a resurgent Essen side, the hosts knocked on the door but failed to find a way to unlock their visitors, the second half more profitable for the hosts. Ten minutes after the change of ends, Harder went off on a mazy run down the left flank, cutting in at the by-line to weave through the defence, pull Lisa Weiß out and lay off to Ella Masar to poke home. The American involved again five minutes later to wrap the win up, dashing through the centre of the box to send Tessa Wullaert’s pull-back into the hungry net with Weiß drawn out once again. With the title all but wrapped up, the hosts had to see out the last fifteen minutes with ten after Masar was shown a second yellow and sent off following a clash with Irini Ioannidou, the dismissal doing little to dampen the mood. Gunning for European qualification and not guaranteed a second-place finish yet, the Bavarians hit Bremen for seven, giving their already strong goal difference a boost insuring one win from their last two will be enough. In a tailspin as of late having lost their last six, Bremen were given an early boost when Marie-Louise Eta curled a free-kick into the top corner to leave Manuela Zinsberger grasping at the air. The lead stood until the last knockings of the first half when Sara Däbritz received the ball from Nicole Rolser, the midfielder taking a touch before sweeping it into the back of the net. The tie turned seconds into the second half when Melanie Behringer’s deep free-kick was sent back across the box by Carina Wenninger for half time substitute Gina Lewandowski to poke home. The Bavarians didn’t stop there though and soon had a third, Rolser finding Däbritz once again, her square pass pinged to feet for the 23-year-old to blast slot under Lena Pauels. The Fourth requiring just another four minutes, Jill Roord’s cutting pass through midfield picked up by Rolser. The diminutive attacker just about bringing the ball under control before clipping it off of the inside of Pauels’ ankle en route to goal. Given a glimmer of hope 65 minutes in, Werder pulled another goal back, Stephanie Goddard header at a corner, skimming off of Zinsberger’s gloves to rattle the bar and slingshot back out for Verena Volkmer to poke home. The comeback short-lived as Däbritz capped off her hat trick seconds after the restart, finishing from 12-yards after deft work by Behringer, Leonie Maier and Mandy Islacker. The rain falling in Bremen as the goals continued to lash down on the hosts, the floodgates long wrenched open, Munich’s sixth belonging to Islacker. With so much still coming down the right side of the pitch, Dominika Škorvánková went off running, gifted space to run into the Slovakian cut the ball back for the striker to ease into the hounded net. Still not finished, the Bavarians had time for a seventh and final goal, Lucie Voňková requiring just six minutes after coming off of the bench, the rangy attacker slotting the ball home after Pauels had parried Verena Faißt’s effort. The match rounds out a bruising run for Bremen, the team having conceded 27 goals in their last seven matches compared to 28 in their first 13. A team that looked like they would have secured safety, Werder will need two big performances in their last two outings this season to avoid boomeranging back to the second tier.